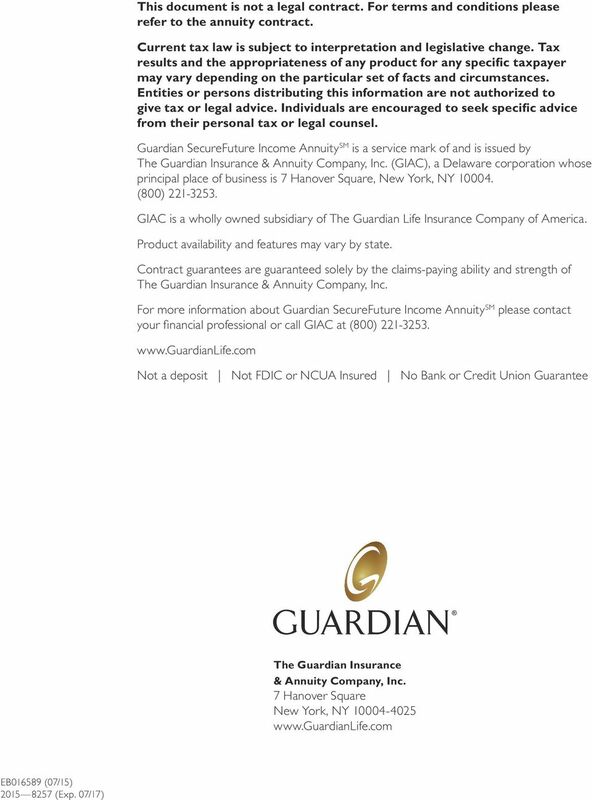 Download "About Guardian SecureFuture Income Annuity SM"
3 Guardian SecureFuture Income Annuity SM is an individual flexible premium deferred paid-up fixed annuity issued by The Guardian Insurance & Annuity Company, Inc. (GIAC) a leading provider of annuity products and a subsidiary of The Guardian Life Insurance Company of America (Guardian). Guardian is one of America s most respected financial institutions, with over 150 years of experience in providing diversified financial solutions, including retirement services, insurance and investments. We are proud of our long history of protecting people from economic risk and helping them enrich their lives. 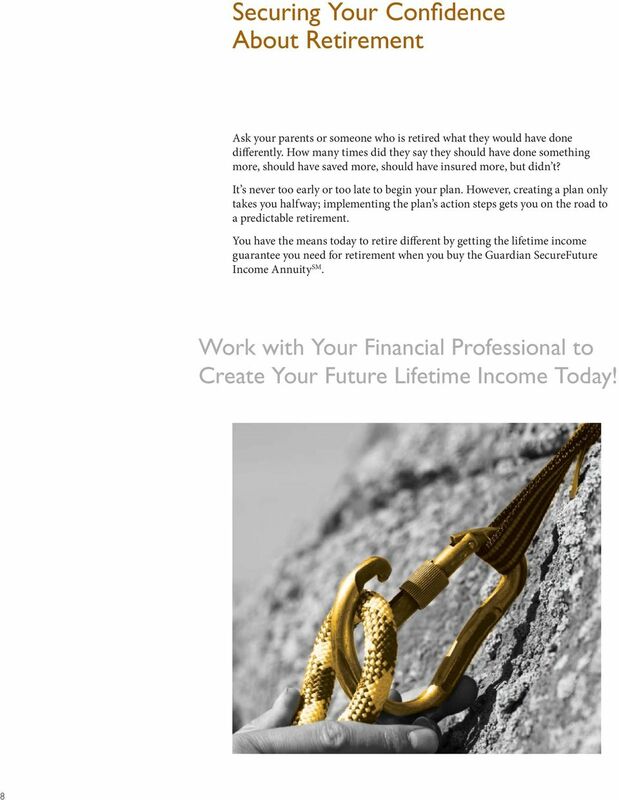 An individual flexible premium deferred paid-up fixed annuity, also called a deferred income annuity, is designed to provide you with a future stream of income through annuity payments that are guaranteed to last for your lifetime and your spouse s lifetime, if applicable. 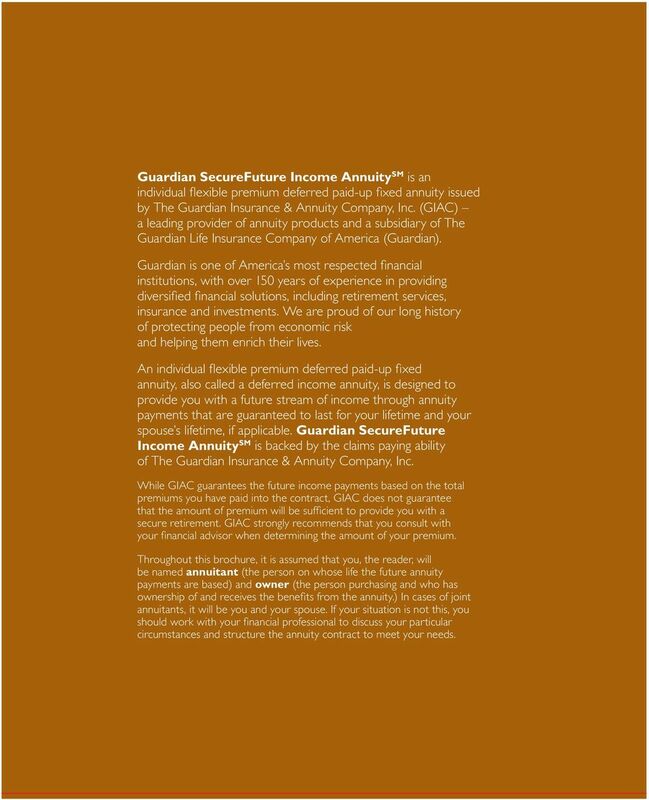 Guardian SecureFuture Income Annuity SM is backed by the claims paying ability of The Guardian Insurance & Annuity Company, Inc. 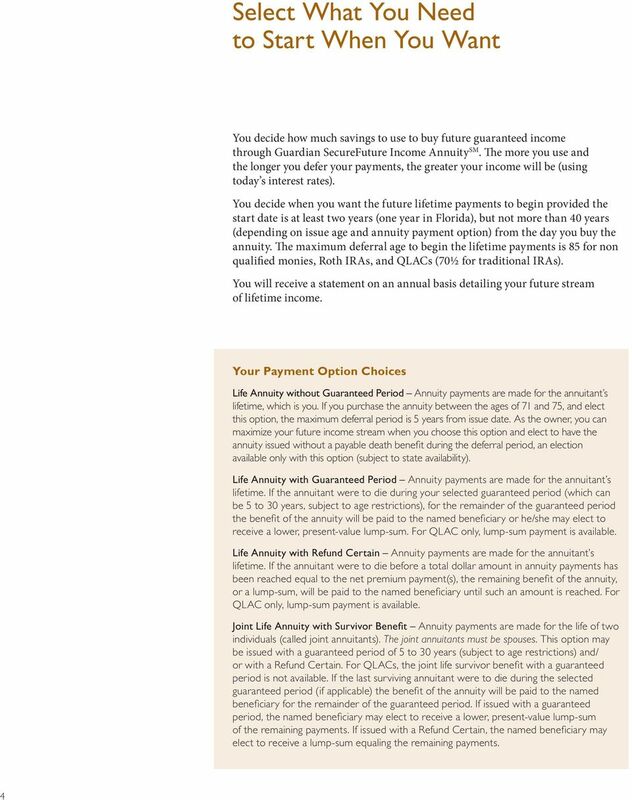 While GIAC guarantees the future income payments based on the total premiums you have paid into the contract, GIAC does not guarantee that the amount of premium will be sufficient to provide you with a secure retirement. GIAC strongly recommends that you consult with your financial advisor when determining the amount of your premium. 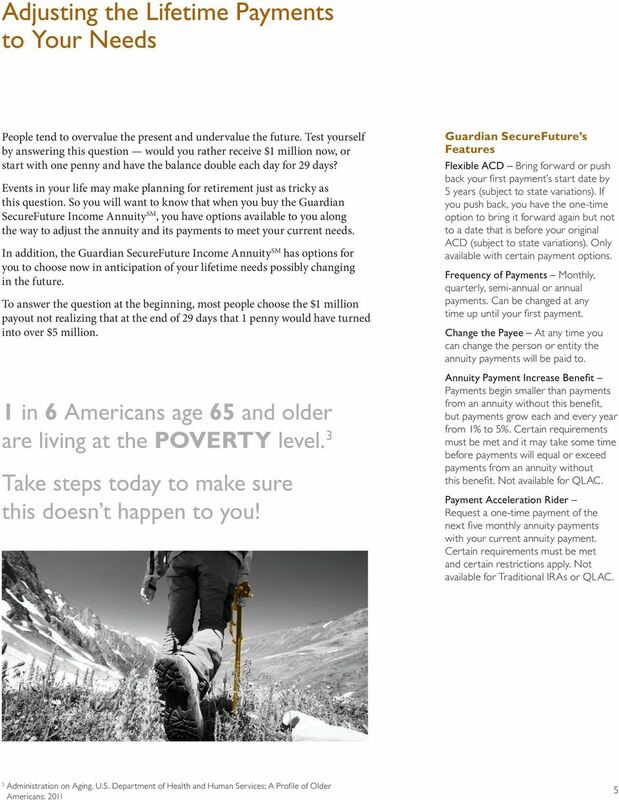 Throughout this brochure, it is assumed that you, the reader, will be named annuitant (the person on whose life the future annuity payments are based) and owner (the person purchasing and who has ownership of and receives the benefits from the annuity.) In cases of joint annuitants, it will be you and your spouse. If your situation is not this, you should work with your financial professional to discuss your particular circumstances and structure the annuity contract to meet your needs. 4 A Future Insured by a Dependable Company GIAC s Exemplary Ratings A++ from A.M. Best Superior; The highest of 16 ratings AA+ from Fitch Ratings Very Strong; 2nd highest of 24 ratings Aa2 from Moody s Investors Service Excellent; 3rd highest of 21 ratings AA+ from Standard & Poor s Very Strong; 2nd highest of 20 ratings As of March 31, 2015 Ratings are subject to change. 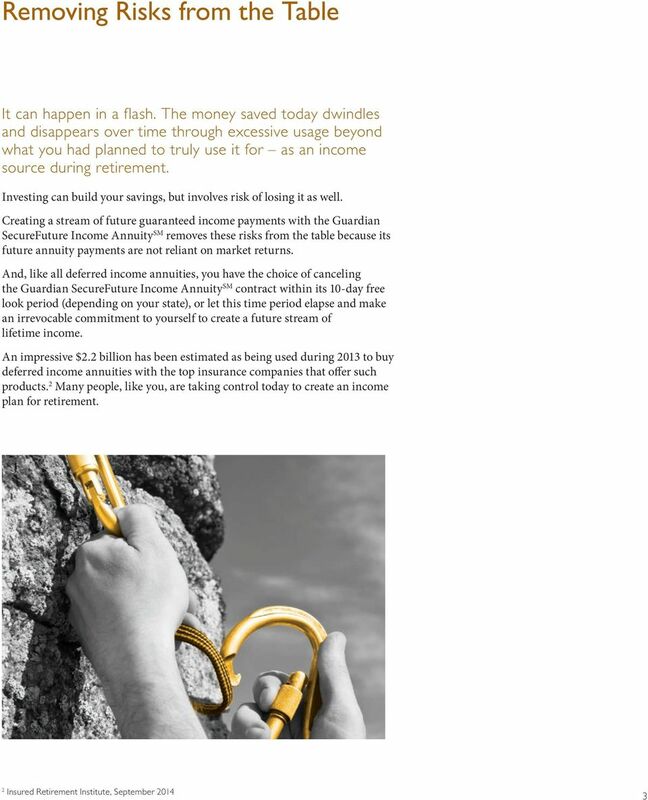 1 in 4 people who are married will live until age When buying the Guardian SecureFuture Income Annuity SM, you are guaranteeing a future income stream that will last for your lifetime and your spouse s lifetime, if applicable. 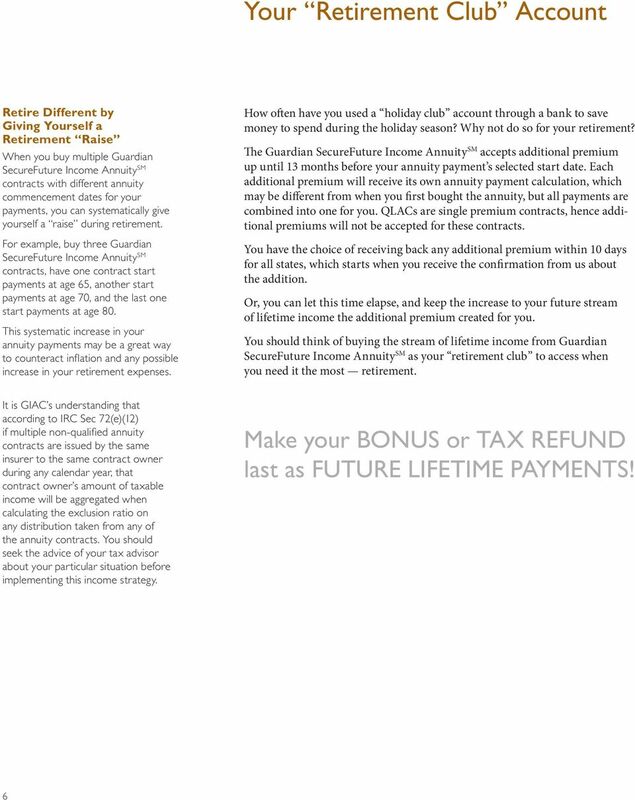 Since the Guardian SecureFuture Income Annuity s main feature is to insure you will have a reliable future stream of lifetime income, you will want to know that GIAC has received exemplary ratings from the independent rating agencies for our ability to meet our obligations to our clients. 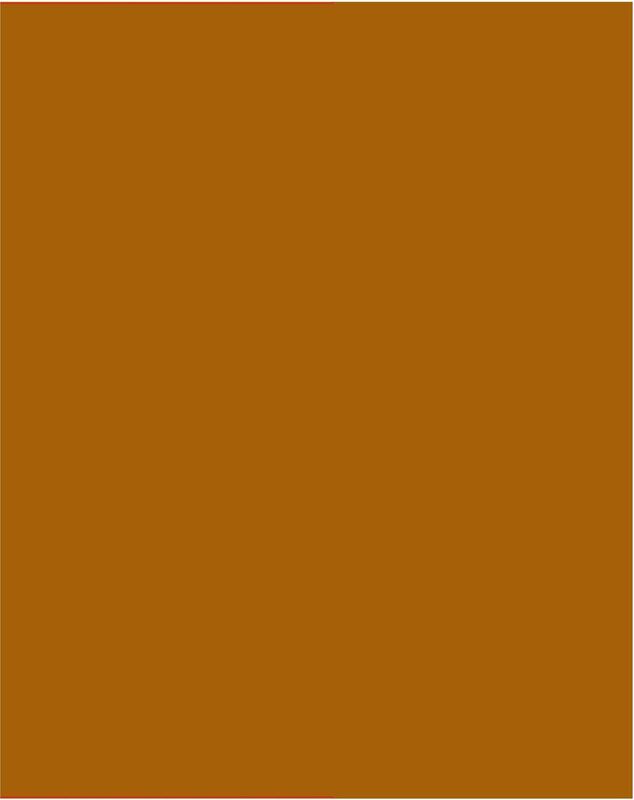 The Guardian Insurance & Annuity Company, Inc. (GIAC) is a wholly owned subsidiary of The Guardian Life Insurance Company of America (Guardian). Guardian is a mutual life insurance company with over 150 years of financial experience and a tradition of offering a diversified range of insurance products. 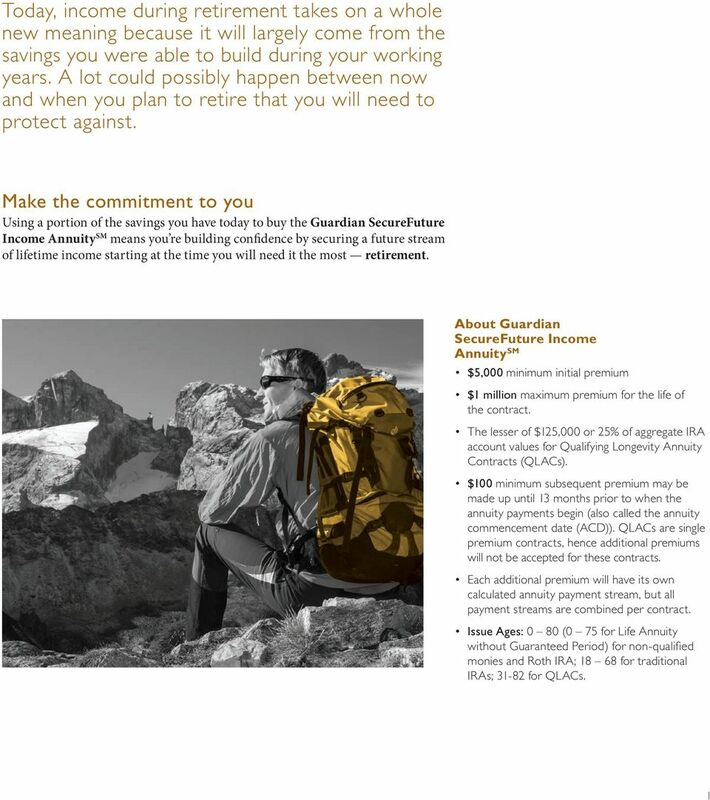 GIAC continues Guardian s tradition of offering diversified retirement solutions through our different annuity product lines. 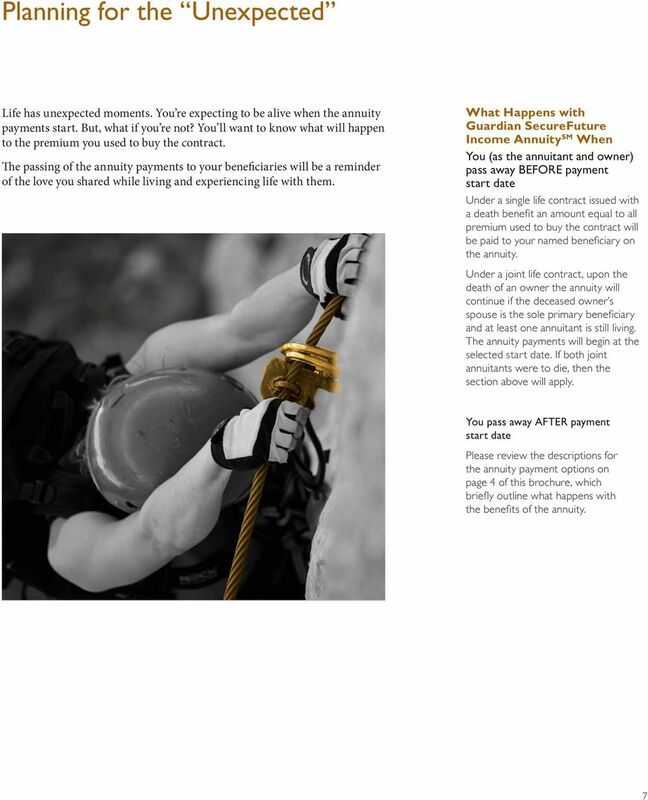 The annuity payment provided by Guardian Secure Future Income Annuity is backed by the claims-paying ability of GIAC, not Guardian. 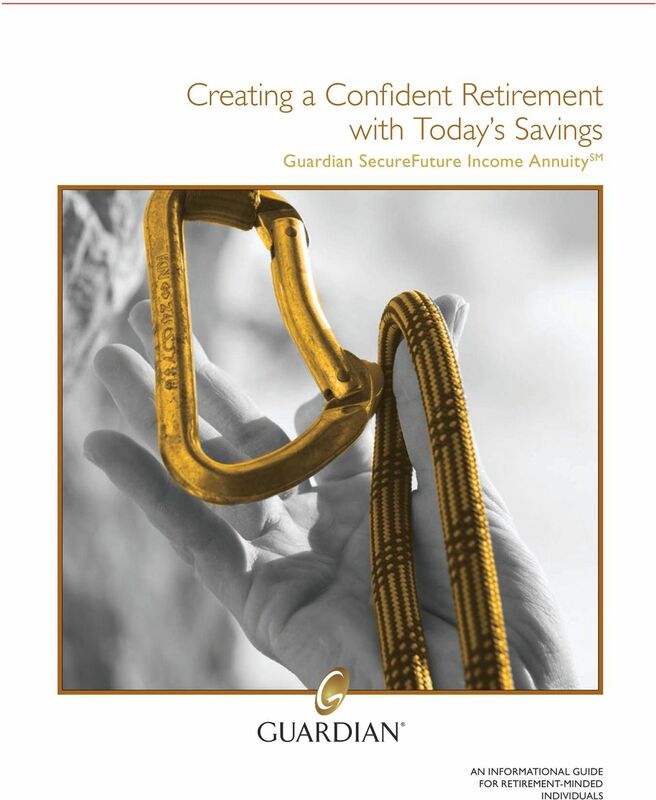 Dependable Service To assure that you have the support you need on your journey, The Guardian Retirement Solutions Call Center is available to you as a lifetime resource to answer questions about your annuity. 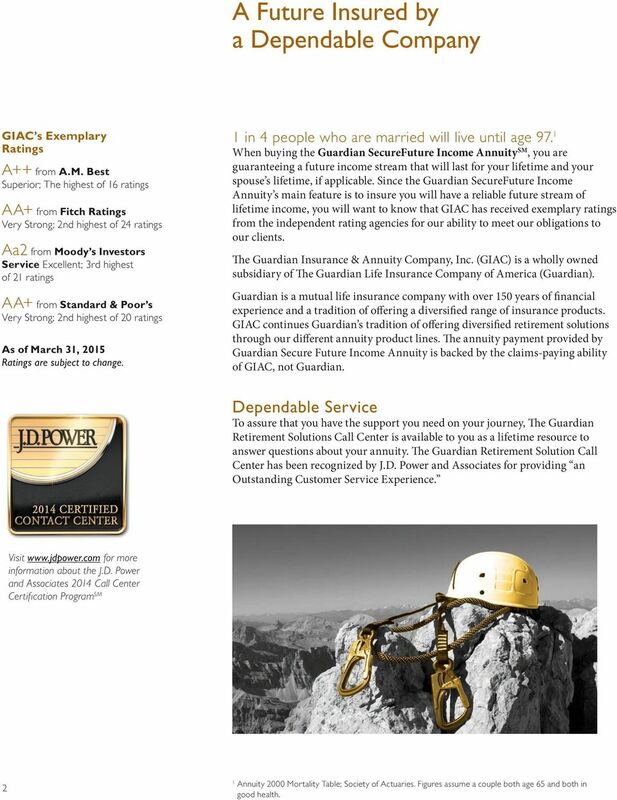 The Guardian Retirement Solution Call Center has been recognized by J.D. Power and Associates for providing an Outstanding Customer Service Experience. Visit for more information about the J.D. Power and Associates 2014 Call Center Certification Program SM 2 1 Annuity 2000 Mortality Table; Society of Actuaries. Figures assume a couple both age 65 and both in good health.
! There are currently two types of IRAs.